Custom Panel allows you to gather all kind of important information and display it as one handy table in the upper right corner of the chart. You can choose the contents of the panel yourself. Every row will show your own customized condition or value. Every column shows a different timeframe. The panel may contain up to 10 rows and up to 8 columns. 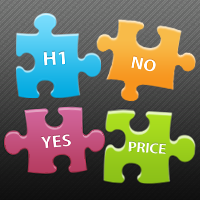 YES_NO - showing YES or NO basing on your custom condition (e.g. 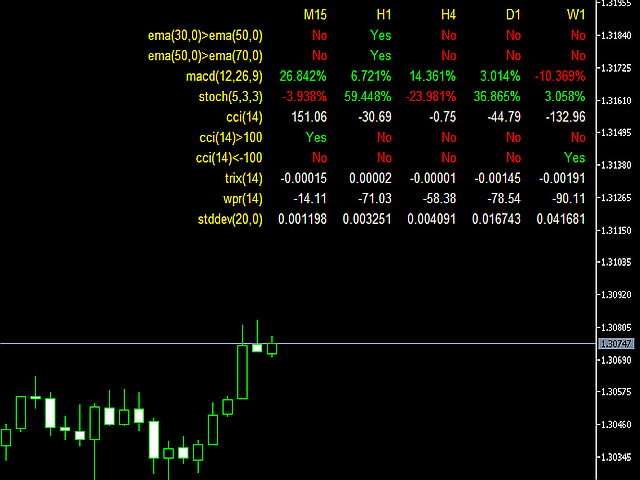 Price > SMA(30), RSI(14) < 30, EMA(5) > EMA(10), ...). You can use '<', '>' and '=' operators. In YES_NO mode exactly one operator (<,>,=) must be used. In all other modes operators are forbidden. The panel recognizes only the following functions. Letter case does not matter. The parameters supplied in brackets can be omitted. The parameters, which are not specified, will be set to default values. For example, it is possible to specify only the first one or the first and the second or all three or none. It's just what I was looking for. Thanks!! фуфло которое через два месяца после покупки перестало работать,попытки обращения к администрации результата не дали,их просто проигнорировали.